A Gyara Mukhi Rudraksha is known to have mystic powers. 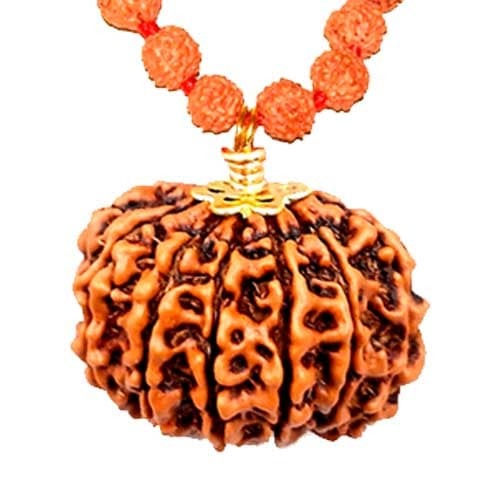 This Rudraksha represents Lord Hanuman. It induces courage and confidence in the wearer, and leads them to an adventurous life. It is also helpful in meditation and removes problem of yogic practices. When invoked it blesses the wearer with wisdom, right judgment, powerful vocabulary, adventurous life and success. A Gyara Mukhi Rudraksha blesses the possessor with strength, wisdom, right judgment, powerful vocabulary, adventurous life and success. A gyara Mukhi or Eleven Face Rudraksha is said to possess the strength of seven deities and hence considered to be extremely powerful. A Gyara Mukhi recommended for: Maintenance of entire neurophysiology. While wearing a Gyara Mukhi Rudraksha one should chant the mantra: Om Shree Rudray Namah Om Hreem Hum Namah . The most auspicious day to wear it is Monday. Order Now! and get direction in life.